User's story 6: Health appliance | IBE TECHNO CO.,LTD. 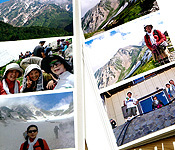 It is June last year that Mrs. Hiroe Senzaki began mountain climbing. So far she has climbed many mountains such as Mt. Daisen, Mt. Fuji, Mt. Sirouma, and Yatsugatake, energetically with local mountaineers. 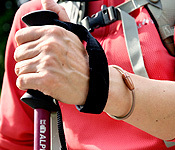 "When climbing, you need to breathe much oxygen in by abdominal breathing. Then you can continue on moving even if you feel exhausted." She tells about the key to keep on climbing. She has been using π-RING since it began to market. When she climbs mountains, she always puts on all types of π-RING. "Once during climbing, one member became sick because of the exhaustion. I put my π-RING for waist off and put it on her thigh. Then she could move within 5 minutes and climb down with us. In another occasion, one person had diarrhea during climbing. I lent the person a π-RING for waist and recommended to drink high energy π-water. Amazingly we came down together safely." Recently climbing members ask her for π-RING for their climbing. So she brings extra π-RINGS for her mates in addition to her own π-RINGS whenever she goes to mountain climbing. Mrs. Senzaki works for a construction firm run by her husband. She is in charge of accounting and general affairs in the company. Besides, she is a driver of a welfare taxi company "Senzaki" utilizing a qualification of the second grade helper. She is putting her all into everyday including jobs and hobby. π-RING supports her busy days. "I like π-RING also as an accessory." She always put π-RING on in her usual days. "You never leave companions in climbing. One of the attractive points of climbing for me is to achieve our goal with the help and the being helped each other. The beautiful sight from the top of mountains is beyond description and the satisfaction caused by the attainment is indeed wonderful." Left : Mr. and Mrs. Senzaki have been using Healer Mat and Healer Pillow for 10 years. When Mr. Senzaki got sick, they bought two sets. "I want him to keep the health, so I took the plunge and bought them." Right : Her cousin Mrs. Tomoko Nishioka is a sales agent of IBE TECHNO CO.,LTD.